Theory and practice in crime prevention and crime reduction have developed and changed significantly, but attention has been focused largely upon conventional forms of crime (especially street crime) and upon ‘situational’ approaches to their reduction. Drawing on research with a variety of relevant organisations across Europe, this article explores the possibilities of developing more effective crime reduction strategies in respect of ‘organized’ crime, an area in which (despite important exceptions, particularly in relation to financial regulation), law enforcement rather than prevention has continued to dominate the thinking and the practical responses of the police and other relevant agencies. It illustrates the difficulties of evaluating prevention in the many areas in which data quality on crime levels and their organisation are poor, but also gives examples (mainly financial crime) where private sector data quality are good enough to demonstrate effectiveness. 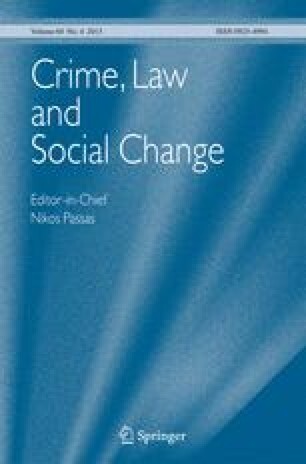 It differentiates impact on crime from impact on the organisation of crime, and between ‘market crimes’ involving voluntary vice and ‘predatory crimes’ involving direct harm to victims, concluding that current performance indicators for enforcement agencies may need substantial revision if the focus shifts to organised crime reduction.